We rang in the year as we usually do, with 4 out of 5 of us visiting Middle Sister’s BFF’s family. In this case, BFF really does mean forever; the girls are 16 and have known each other since they were 2 1/2! It was a low-key time, just hanging around, laughing, watching the Twilight Zone marathon, eating, and heading out the door at 12:01 for a really impressive fireworks display. I think it’s been a whole year since I’ve stayed up until 1 AM. And the Hot Flash Express rolled through at 6:30, mercifully an hour or so late, though still earlier than I’d like. I enjoyed a quiet start to the day; the Big Kids both stayed at their friends’ houses (Big Brother rings in the New Year with a friend he’s known since kindergarten) and Little Brother is still asleep. Cup of tea in hand, I had some uninterrupted time for morning prayer and the newspaper. Basically, it’s a basketball-sized cage around the bird feeder tube. It’s taken them a few days, but the birds are finally getting the hang of it. And having my desk near the window lets me get a good view. I like that the big bully birds (starlings and blue jays) can’t get in, but the sparrows and other small birds can. Haven’t seen any snowbirds this winter, but then again, we haven’t seen any snow–and that’s not necessarily a problem. Christmas vacation is almost over; today, there’s noon Mass; tomorrow our little family business will hold its annual meeting and review, and then on Tuesday, it’s back to work and school for everyone! For right now, I’ll enjoy my perch at the desk where I can watch my bird feeder. 7 sparrows, no waiting–and the starling has been foiled again! Happy New Year! Peace and all good! Bully birds? I love Blue Jays! They are my favorites and I throw them peanuts every day. They don't mess too much at our feeders. Must not like the grub. ;-)Happy New Year! Aww, poor bully birds still need eats … do they have a separate feeder they can nom at? :-PAnd I'm kinda' jealous that you have bluejays — our population is still recovering from the *#(^%! West Nile virus and it's been years since I've seen any in our area. Thankfully, the crows have steadily been bouncin' back and we've been seeing more of their splediferousness flappin' about! :-)BTW, when I saw your link to this post in FB, I thought the accompanying thumbnail pic was of a disco ball! Bwahahaha! The bully birds can eat what the little ones drop on the ground. There's plenty.Last night when the ball dropped in NYC, my husband said, "Hey, that's your bird feeder!" What a peaceful start to your day! Watching birds outside your window sounds very relaxing. Happy New Year and many graces and blessings to you and your family this year! The most elaborate stands include shelving compartments to store the pet's food and toys. 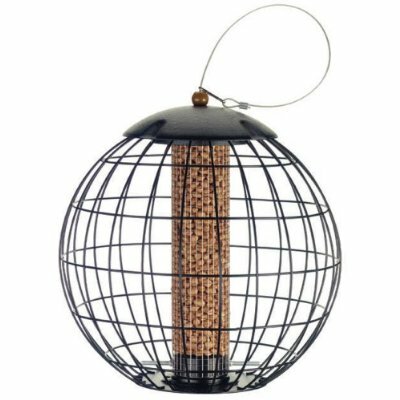 If you want to spoil your bird, it will definitely enjoy this organized form of pet bird supplies. Homes with minimal space should get a hanging bird cage stand. A bird cage hanging stand also works for modern designed houses. Be sure to get a stand that fits your bird and your home. The stand should fit both so neither party feels inconvenient.